The Icelandic Sheepdog is believed to be from Scandinavia in the 9th century. Rumor has it that Norwegian Vikings brought over their furry companions when taking over Iceland, leading to their popularity in this area. Since the island did not allow other animals to stay on the island that was not native, the genetics of the Icelandic Sheepdog has stayed the same throughout their entire history. Back in the day, this breed would herd sheep and other cattle on the rough terrain of Iceland. When they weren’t working in the field, they would be an excellent companion to their owner and loved ones. In more recent times, the Icelandic Sheepdog was an unknown breed to the United States until 2010 when they were finally recognized by the AKC. Sociable and confident- there is nothing this breed wants than to be with their family. The Icelandic Sheepdog craves companionship, and in return, they will provide their owners with all the love and loyalty they could possibly need. However, keep in mind that this breed does not do well if they are left alone for too long, and may even develop separation anxiety or depression. Since they are also very alert by nature, the Icelandic Sheepdog can be a great guard dog, ready to warn their owners at the first sign of any intruder. They are never violent and usually do very well with new people or other animals in the household. As long as you are patient when dog training your Icelandic Sheepdog, you should have no problem with getting him to listen. These dogs are people pleasers and enjoy nothing more than to see a smile on their owner’s face. That’s why when it comes time to training, they are fairly easy to learn new things. Just like with any other dog breed, it’s important to socialize your dog with different people, places, sounds, and experiences at a young age. This will help your pup become a well-mannered and behaved household pet later on in life. Since the Icelandic Sheepdog is from the herding breed, it’s expected that they need lots of exercise to stay happy and healthy. Their athleticism needs to be pushed in one way or another, whether it’s a run around the block or some type of agility training. On average, the Icelandic Sheepdog lives between 12 to 15 years. As said before, the Icelandic sheepdog has had a very recent introduction to the United States. Today, this breed is ranked as the 153rd most popular dog breed by the AKC. While they may not be very popular, the owners that do have them love their affectionate and athletic qualities. When it comes to feeding your Icelandic Sheepdog, make sure you provide him with an all-natural and nutritious dog food. Each day, your dog should consume two separate meals and have a bowl of fresh water available at all times. The amount your dog should consume will vary on his age, size, metabolism, and activity level. 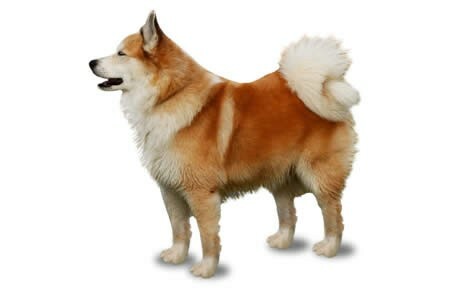 The Icelandic Sheepdog has a waterproof coat that comes in two different varieties, either medium or long. Luckily for owners, all they need is weekly brushing to keep their coat nice and healthy. Along with these grooming practices, make sure to check their ears and eyes for any infection and brush their teeth on a weekly basis. Lastly, trim their nails regularly to prevent overgrowth or breakage from occurring. Are Icelandic Sheepdog Good With Kids? Since they are both playful and energetic, the Icelandic Sheepdog is the perfect partner for children. They are also an ideal size where they aren’t too big for knocking down a child, but they’re hefty enough where they won’t be injured when roughhousing. Like with all other breeds, it is always recommended that a child and dog is supervised by a parent during all interactions. Cryptorchidism: cryptorchidism occurs when either one or both testicles are missing when the dog is born. The main cause of this is believed to be an abnormal genetic trait, however, there are many other theories that may be at fault. Cataracts: This common eye condition occurs when the lens of the eye becomes clouded over or opaque. This causes vision to worsen and can lead to blindness over time. If your dog has cataracts, corrective surgery may be recommended. Hip Dysplasia: Like many breeds, canine hip dysplasia is a common condition that can affect a dog. This deformation causes the thighbone and hip socket to rub and grind against each other, leading to pain, lameness, and eventually arthritis. National Breed Website: The Icelandic Sheepdog Association of America, Inc.